So you’ve just arrived here, asking yourself, “Why the hell should I care about making jam”? There are SO MANY REASONS! You can become a pseudo-foodie, start your own business (you’re welcome), impress your friends and family, jam your way into your crush’s heart, solve your inadequate gift giving talents, learn to preserve food for when the world becomes the Walking Dead (like you predicted), and…you get the point! 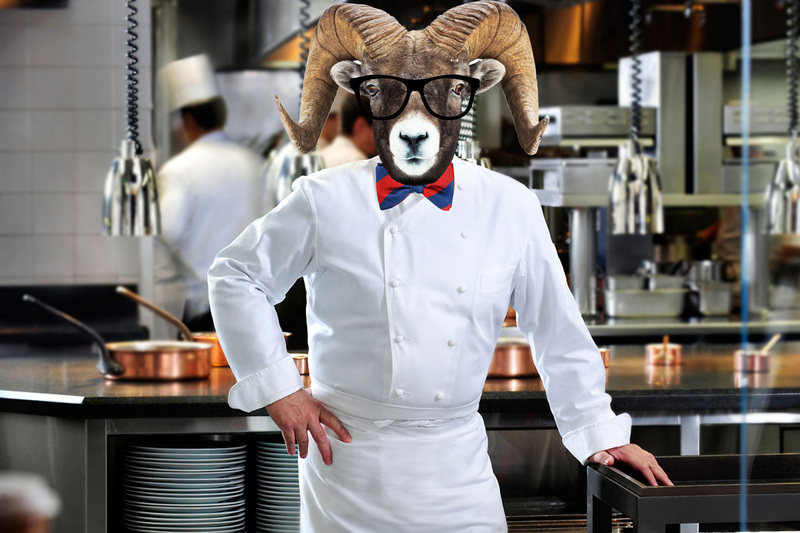 In less time than it takes to watch a re-run of Seinfeld, The Jam Ram will teach you how to become a jam expert. You will also be introduced to some of the best and most reliable tools you need. Pretty good deal, ain’t it? This is going to surprise you…the fruit you choose has the biggest impact on how your jam tastes (and looks). You should be using the ripest fruit possible AT ALL TIMES! We can’t repeat this enough. The main reason is that the sugar content in your fruit increases as it ripens, and really brings out the flavors in your jam. Let’s look at an example of how this works with Strawberry Jam, in the box below. If you’re not interested in the details, feel free to skip it. Most fruits like strawberries are made up of 10-16% of sugar, with the rest being water. On the low end, LOW quality, unripe strawberries are made up of close to 10% sugar. Really HIGH quality, ripe strawberries are closer to 16% sugar. That’s a 60% difference! During the jam cooking process, it’s the water evaporating from the strawberries that ends up making jam what it is. If you have the ripe (16%) strawberries, the strawberries and their flavor are going to make up a larger part of your jam, and create a much better tasting jam. Whereas, the low quality strawberries, at 10%, will have the taste of sugar dominating the taste of the strawberries. The basic jam recipe is equal parts sugar and fruit. If your fruit portion isn’t ripe and its sugar content is lower than it should be, then your jams won’t taste right because the fruit half isn’t pulling its weight. The difference in sugar between a high quality ripe piece of fruit, and mediocre unripe piece of fruit can vary as much as 60%! Additionally, the riper the fruit, the better the yields. 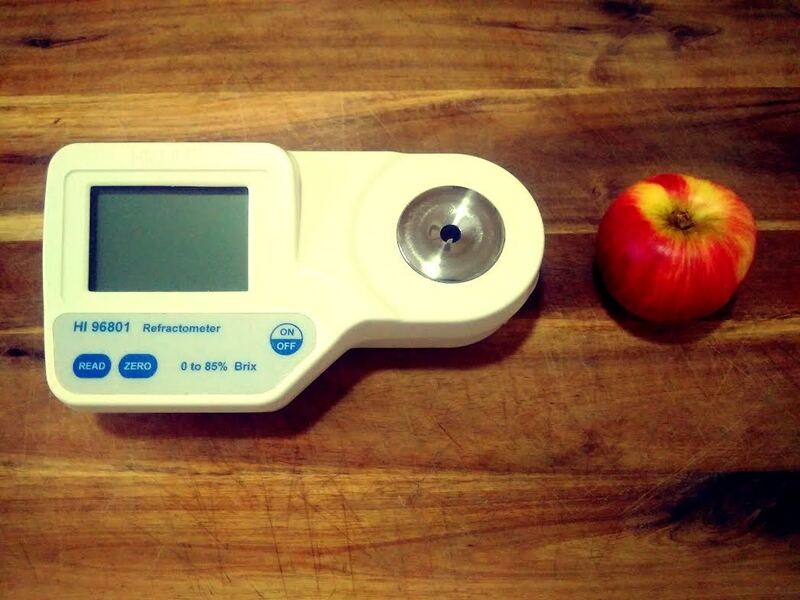 If you make it far enough, I will tell you how you can easily test the sugar content of your fruit. The fruits you’re using should be acidic enough for canning. Here is a guide with common pH levels. You want your fruit pH to be less than 4.6, which is the level deemed safe for canning. So it’s no surprise that the most common jams you find on store shelves use strawberries, raspberries, blueberries, apricots, etc. Remember this point about the pH, because it’s one of the most important rules in canning. We’ll get into this some more a little bit later. The most basic sweetener is of course, granulated sugar. This has been used in jam making for a long time, and as traditional as you can get. The sugar is the other important point you should remember when making jam. The addition of sugar and cooking reduces the water content in your mixture, increasing the percentage of sugar solids in the finished product. This is essential to preserving safely, and we’ll explain it in a little bit more detail in the Cooking section. The Jam Ram doesn’t like to use pectin in jam making. He prefers a loose set if it means not adding pectin. What’s wrong with pectin? Nothing really. It’s a natural ingredient extracted from apples or citrus fruits. But, it is extracted using chemical processing. If you feel the need to use pectin and are adamant that it goes in, soak some apple skins and seeds in a little bit of water overnight. Let it thicken, then pour that into your jam mixture. So we now know that sugar and fruit are the essential ingredients in jam making. Wait…what is that you say? You’re asking why a lot of jam recipes add lemon juice? Well for one, lemon juice helps make your mixture more acidic. Secondly, it helps maintain the color and brightness of your fruit. Third, it will take away the bite off some of the sweetness. And last but not least, it helps the gelling especially when adding pectin. So always squeeze a couple of drops of lemon juice. It can only help. Great! You’ve gotten through the hardest and most important part in learning how to make jam… picking your fruit and understanding the ingredients. Now it starts to get easy. We have to prepare. Have you heard of the French term “Mise En Place”? If you haven’t, it means “putting in place”, and is used heavily in kitchen settings when referring to preparing and organizing all of your ingredients BEFORE the cooking process. Sure, we all wing it when cooking dinner after a long day at work from time to time, and the results aren’t that bad. But things can get away from you very quickly in jam making. So this REALLY matters. Your fruit needs a thorough wash. From collecting dirt, dust and pesticides on the farm, to being in transport, to hands touching your fruit in the market, you don’t want your jam being contaminated in any way. Any old colander or strainer works fine, but if you’re serious about jam making you’re probably going to be doing things in larger batches. If you have a good-sized sink, a larger colander will save you loads of time and effort. And if you happen to be picking your own fruit, go for a massive one, as you can just pick your fruit into the colander and throw it right under the water. You might have to hull 50 strawberries or halve and pit 20 apricots. It’s just part of the process. As you work with the fruits more often you’ll get fast pretty quickly. The one thing you have to be very careful of in this part is – being gentle with your fruit. Make sure you’re using a sharp knife, and be very methodical and slow to start. Pressing or pushing down on your fruit can release essential juices. You absolutely do not want to do this. The cuts should be clean indicating that the fruit has not been compromised at all except for its new shape. The size and how chunky you want your jam is completely up to you. But make sure the pieces are the same size, so that they cook evenly and equally, which means they will break down at the same rate while cooking. A good paring knife goes a long way because you want to be quick and nimble. Paring knives are shorter and smaller knives used for more intricate kitchen work. Once your fruit is sorted, washed and cut you should weigh it. You usually know what amount of fruit you’ve purchased, so it’s not necessary to weigh it beforehand. After the preparation period, you will lose some weight from pitting or hulling. So this post-prep weight is the one you should stick with. 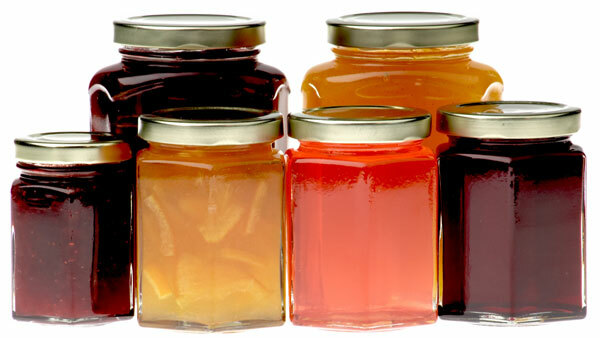 And in jam making and most preserving recipes, the amount of sugar is dependent on the weight of the fruit. So write it down or remember it. There is not much to say about scales, except that you want it to be big enough. Normally, once the fruit is prepared, you can place your cooking pot on the scale, reset to zero, and just add your fruit. So you want your scale to be large enough to accommodate the pot, and be able to calculate up to at least 10 lbs/5 kg. Of course, a scale has many other important uses in the kitchen, and once you start using one you’ll find you will start to rely on it. If you create a recipe that is amazing, you can always recreate it perfectly by using the precision of a scale to weigh your ingredients. Now that you have weighed your fruit, you can prepare the rest of the ingredients. Unless you’re following a specific jam recipe, you probably want to make your own amazing jam on your own merits. That’s simple. 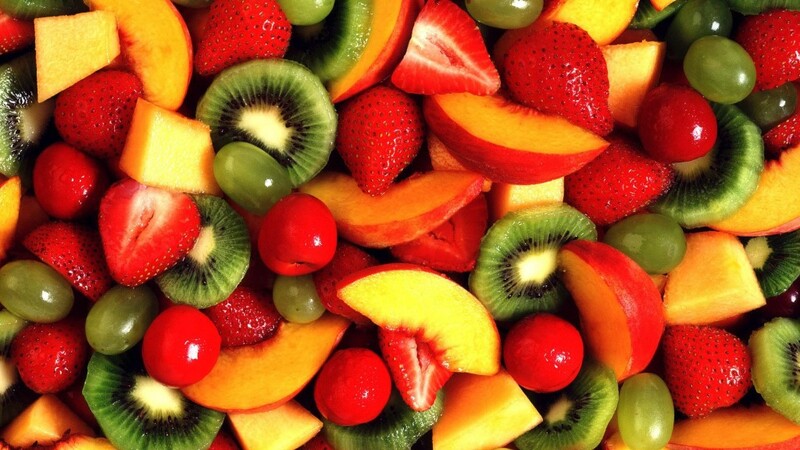 To start, just weight an equal amount of sugar to the weight of your fruit. If you’ve weighed your fruit in the cooking pot, remember the weight, reset to zero, and add the same amount of sugar. Fantastic! Now if you want, add a few dashes of lemon juice and some spices. And you are ready to go! 1) The lid and band: Ball brand jars are this type, and these lids work great because you only have to replace the top “metal lid” part. 2) Twist Cap: Make sure the lids have the sealing compound inside. 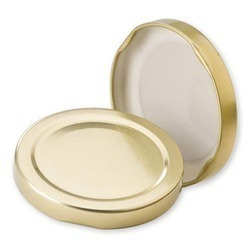 You can tell if the lid has a soft rubbery surface on the underside. 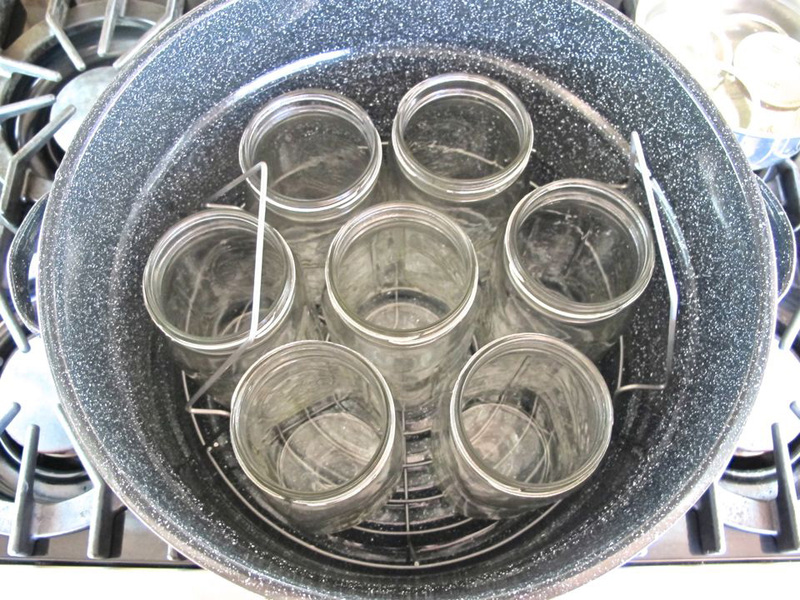 Both jars and lids needs to be sterilized prior to use. You have two options when it comes to sterilization. 1) Oven: Less costly, you can stick your jars in an oven at 120 Celsius/250 Fahrenheit for at least 20 minutes. Make sure to spread the lids out on a baking sheet, with the inside of the lid facing up. As for the jars, they can also be stood on a baking sheet, or others might rest the jars horizontally in between the bars on an oven rack. 2) Boiling water bath: You can use a canning kettle or a stock pot for this, but would need to line the inside with a some type of rack, to avoid jars touching the bottom or walls of the pot which can get very hot and cause breakage. This image is a perfect illustration. The jars are fitted snugly onto a rack. The next step would be to add water to cover them by a couple of inches, and boil away! Of course, the Jam Ram starts this process before making the jam, so the jars are boiling until it’s time to fill. These kits are important as you will need them for post-fill processing as well, since you have to sterilize your jars after filling the jam. So you are better off getting a preserving canner/kettle as pictured above. Seriously, that was EASY! You’re more than half way there. We can now move on to the exciting stuff. Your ingredients are prepared, your jars are being sterilized, it’s finally time to start cooking, good looking! Facilitating is quite important when it comes to cooking jam. Your main job as a jam maker is to stir. You want the heat to distribute evenly throughout your mixture, and you don’t want any sticking or caramelizing at the bottom of your pan. Standing over your jam and stirring constantly doesn’t always have to be done, but it should be done frequently. The Jam Ram was also fortunate to receive advice from a zen master who said, “Standing by your pot and stirring constantly, helps you be one with your jam”. Never question a zen master. There is something special about standing over your jam, stirring it, feeling it as it cooks, seeing it transform from separate ingredients, into a combined shiny stew of deliciousness. You really learn to understand it and feel it, and from experience, it ends up better. Your job facilitating and the final outcome of the jam, can be greatly enhanced by the tools that you use. You generally want a pan that is going to heat quickly and evenly. Aluminum and copper do this the best, however, the metals tend to react with and seep into the food you are cooking. Stainless steel works great, but doesn’t heat as quickly. Also, you can use a cast iron pot/casserole, but make sure it is enamel coated as iron can seep into your food as well. Now you will surely ask, “Well Mr. Jam Ram smartypants, then how come I always see pictures of jam being made in beautiful rustic copper pans?” You’re right, they are beautiful. Even though copper could seep into your food, it is safe to use, only if you mix your fruit with sugar before tossing it in the pan. REPEAT: IF YOU ARE USING A COPPER PAN, COMBINE THE FRUIT WITH THE SUGAR FIRST AND YOU WILL BE SAFE! This helps prevent the fruit from reacting with the copper. Another important jam characteristic is, that you want the top of your pot to be wider than the base. This helps it cook more efficiently because you have more surface area that can convert to steam. You should also use a wooden spoon or a high temperature resistant plastic spatula for the stirring. It isn’t very wise to cook your jam on high heat all the way. Keep the heat on medium or medium high, until you really get the hang of it. It’s pretty rare to keep the heat on one setting throughout the cooking process. See, I told you this part was easy! All you have to do is stir until the jam is ready for filling. How do we know when it’s ready for filling? According to the FDA, an item can be called “Jam” if it has at least 65% soluble solids, or in other words, sugar. Fruit butters, for example are required to have no less than 43% soluble solids. And now your reward. Earlier I mentioned that I would tell you how to check for the quality or sugar content of your fruit. 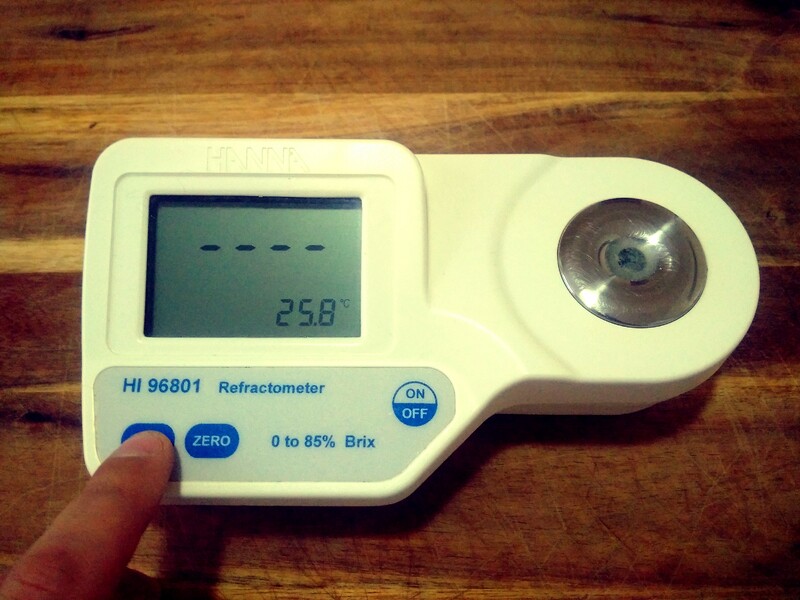 You use a tool called a Brix Refractometer to estimate it. 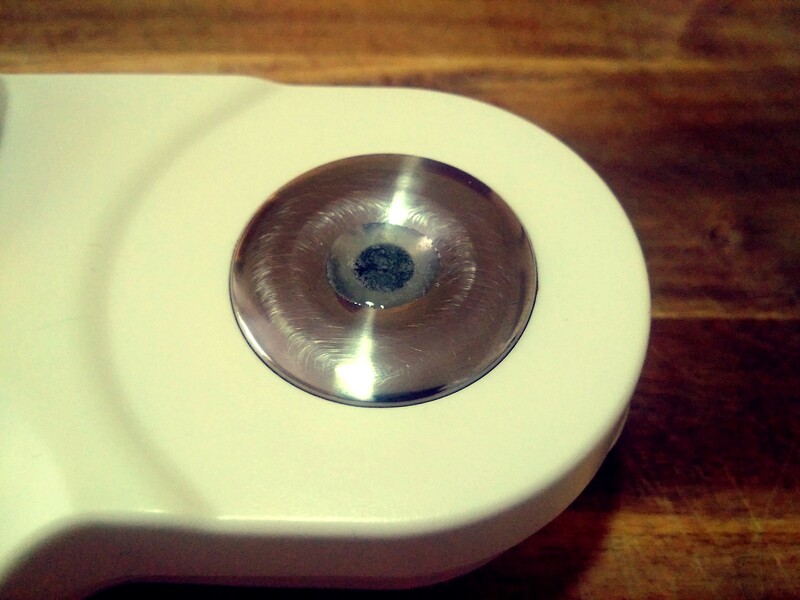 It also checks the sugar content of your jam to let it know when it is done! A Brix reading acts as a proxy for the nutrition content of your fruit. While sugar content is the dominant component of Brix, the reading is frequently used to determine the general quality and nutrient content of fruit. So it’s an important tool to have, whether making jam or not! Soluble solids levels influence the commercial use and consumer reaction to many fresh fruits and vegetables and their value-added products. 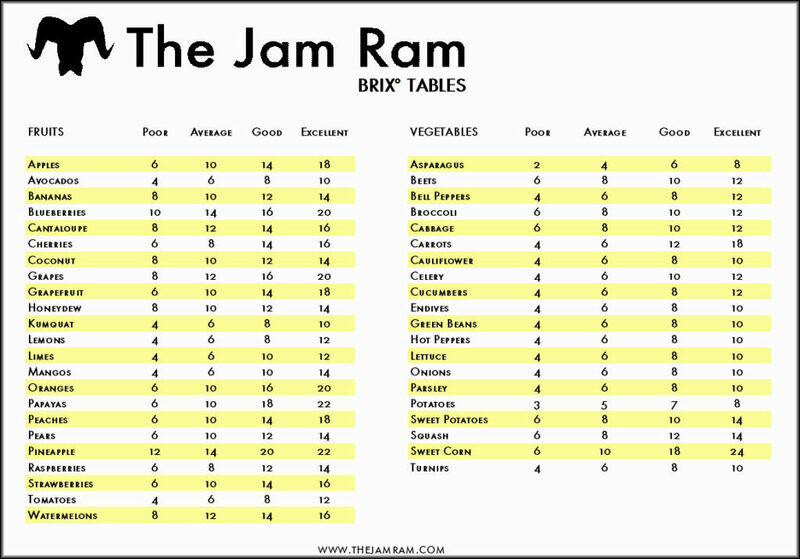 This makes clear why °Brix is used throughout the produce, food, and beverage industries. Field managers use °Brix values to assess harvest readiness of grapes, melons, and other crops. 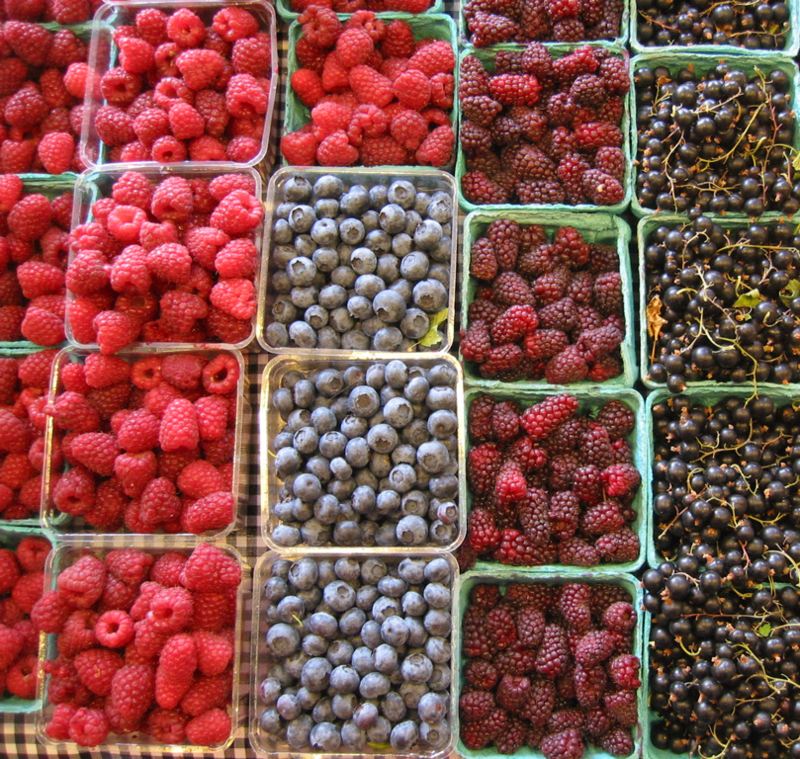 Grocery stores and restaurant produce managers use °Brix values as an indicator of potential crop quality. Buyers of crops used to make various products routinely measure °Brix of fresh or stored crops before they are used in the making of beer, wine, juice, sauce, refined sugar, and other products. In these situations, even small differences in °Brix values influence the bottom line. So, °Brix values are examined closely. 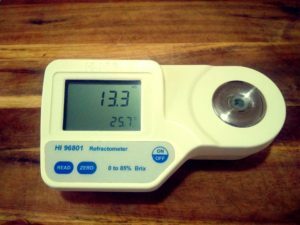 There are two kinds of refractometers you can get – analog and digital. 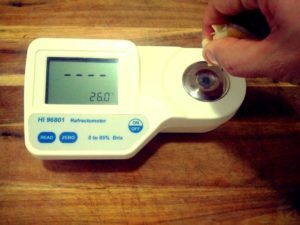 Here is how I used a digital refractometer to test the quality of some apples that I bought on sale from a farmers market a few days ago. 6. A 13.3 reading. Compare to the table below. Not bad! “THAT’S IT?!? !” you ask. Yup, that’s it! So you can squeeze some strawberry or raspberry juice onto your refractometer to check the sugar content or ripeness. But most importantly, you can check when your jam is done. Check the reading frequently throughout the cooking process with a few drops at a time, and once the refractometer reads 65, you…are…done! Make sure you get a refractometer with a high enough reading, since jams should come in at 65% sugar. And check that it has temperature compensation. They can also be used for brewing and making wine if that’s your thing. You have cooked your jam, it looks, tastes and smells delicious, and is ready to go in the jar. Step #5 of How to Make Jam will show you how to safely fill and sterilize your jars. Your jam is about to reach its setting point, so go ahead and pull out your jars from their sterilization chamber. If it’s coming out of a hot water bath, sit them on the counter on a towel with the mouth up, and let the water evaporate. I would like to tell you that all you need to do is fill your jars and cap them. But that’s not true. There are a few steps that need to be taken. First, with a high temperature digital thermometer or candy thermometer, you want to make sure that your jam is at least 85 Celsius/185 Fahrenheit. 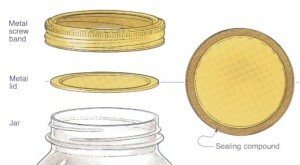 This will ensure that the jam is hot enough to kill any dangerous bacteria when filling the jar. Your jam has to be below 4.6 to be safe for canning, and the Jam Ram recommends going lower for a margin of safety. In most cases, if you are using acidic fruits this will already be the case. But if you want to be a self-sufficient jam maker, then testing your own pH must be done. 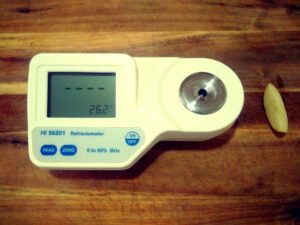 Here are some really good pH meters. They will come in handy with jams, but even more handy if you want to make the move to chutneys and sauces. To be really safe and follow a proven method, you should put your jar in a boiling water bath for 10-15 minutes. You MUST make sure that your jam is being filled at the recommended temperature, and that the pH is below 4.6. If you don’t, it can kill you or a loved one (really). Botulism is a bacteria that survives in vacuums that are moist and not sufficiently acidic. Botulism gives off no trace of its presence, and you may think your jam looks fine. Please take this very seriously. You can go to the CDC page here for more info. Once your processing time is done, pull your jars out, set them on a tea towel on your counter, and let them air dry for a few hours. Try to avoid putting the jars on cold surfaces or the cold shock will cause them to break. And now you are done! DONE! Now you can take all that you’ve learned, and head over to The Jam Ram’s curated recipe page with some of the internet’s best preserve recipes!